First of all, what are Permalinks in Blogger.com? 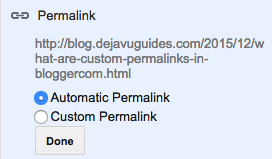 Permalinks are the name and URL of your blog posts on Blogger.com. Normally when you write a blog post on Blogger.com, it’s automatically generated for you based on the title of your blog post. The main reason you want to customise it is to help make your blog posts more readable to your visitors so that they know exactly what your website page is about. The other reason would be for SEO (search engine optimisation) benefit, which supports your visitors need to be able to read your website easily. Permalinks are part of the SEO features in Blogger.com that was released 2012. So to create your own URL for a specific post, simply select “Custom URL”, and enter your new URL in the field below. Taking the example from the suppport website from Blogger.com. Where, the bolded area is the portion of the URL that is customizable. Is it worth customising my Permalink for my Blogger.com account? Check if the Automatic Permalink is clear to read and suits your need. If it doesn’t then it’s worth customising your Permalink for your Blogger.com blog post.